Start by lining a 6×2” pan with some parchment paper. If you don’t have one here’s a link to the one I’ve used for years for ALL of my cheesecake recipes: http://amzn.to/2fbhIfP. By the way if you hate shaping your parchment paper like me use some metal binder clips to hold the sides down, they’re oven safe! Next take out a bowl and crush up 4 ginger snaps. You can easily crush them up by using the back of a glass and pressing down. You’ll want them pretty fine since we’re using them for our crust. After that add in 1/4 cup of almond flour and 3 tablespoons of melted butter. Mix everything together, add it on top of your parchment paper, and press it down to shape your crust. Bake it on 350F/176C for around 8-12 minutes or until the top is golden brown. 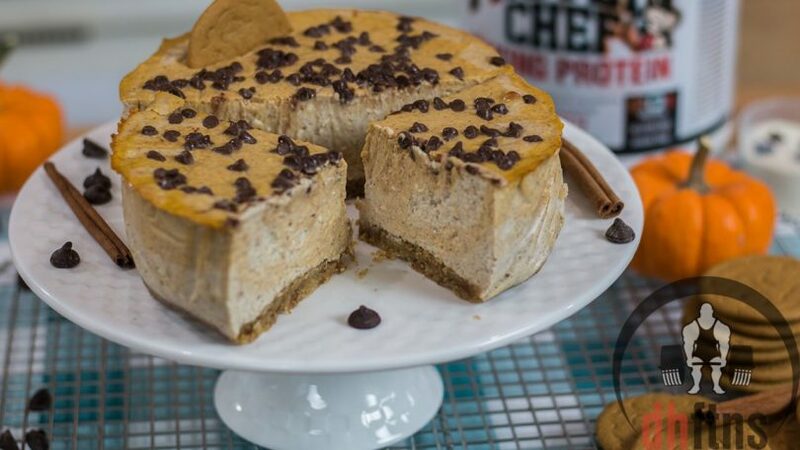 Now take out a large bowl and add into it 16 ounces of fat free cream cheese, 1 large whole egg, 2 large egg whites, 1/3 cup of a sweetener, 1-2 tablespoons of a light brown sugar or brown sugar substitute like Sukrin Gold, 1 1/2 teaspoons of vanilla extract, 1/2 tablespoon of pumpkin pie spice, 1/2 teaspoon of ground cinnamon, and 2 containers or 10.6 ounces of pumpkin or vanilla Greek yogurt (I personally like to use one of each flavor). Mix everything together then you’re gonna mix in 2 scoops or 60 grams of my Baking Protein Powder. Once mixed take out another bowl and pour half of your mix in it. In that bowl add 1/2 cup of pure pumpkin and mix it in. For your first layer pour some of your non-pumpkin mix in it, smooth it out, and on top of that add a pumpkin layer and smooth that out. Repeat until all of your mix is gone and then cut it in with a knife to give it that swirl effect! Add some chocolate chips on top or whatever else you want and put it in the oven on 350F/176C for 30-35 minutes. After 30-35 minutes drop your temperature down to 200F/93C and continue baking it for another 50 minutes to 1 hour. 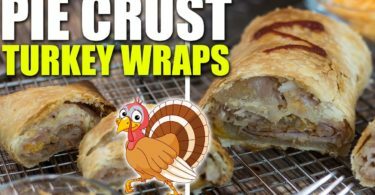 Take it out, let it cool, wrap it up, and put it into the fridge for a couple hours. Once your sweet tooth kicks in, remove it, unwrap it, remove any moisture with a paper towel, cut it….and…DEVOUR!!! Seriously, I could say stuff like delicious, amazing, unreal, **** ****, and so on but all of them would not do this cheesecake justice…not just this cheesecake but any of them that I’ve made. If you’re scared to try one…DON’T BE! Aside from the taste they are extremely hard to screw up!!! What’s YOUR favorite cheesecake? Let me know in the comments below! Carbs: 159g = 140g NET CARBS! Carbs: 19.8g = 17.5g NET CARBS! 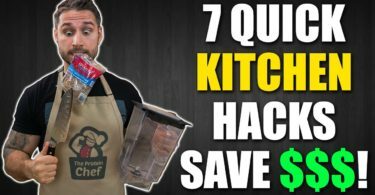 7 QUICK KITCHEN & LIFE HACKS! SAVE MONEY!